Yesterday, The Special Gathering Choir of Indian River sang at Eastminster Presbyterian Church in Indialantic, Florida. The Special Gathering is a ministry within the mentally challenged community. Our mission is to evangelize and disciple people who are developmentally disabled. However, we realize there are many misconceptions about our population; therefore, our ministry to the Church is to help educate them to the spiritual needs of people who are mentally challenged. After the choir sang their two selections, they received a resounding, standing ovation. They exited the church, all smiles and returned across the river to Melbourne Special Gathering to catch their rides home. I stayed for the entire service. After the benediction, the pastor, Rev. Elmer Floyd, graciously asked me to stand at the door of the church and receive the members as they left the sanctuary. That is an honor that is sometimes given to us by hosting churches. Long ago we learned to understand but underestimate the emotional effect the choir have on audiences. Because emotions are temporary vapors that are whisked away in the wind. Yet, there are always several people that are deeply effected by the choir. Not on the emotional level but in the inner recesses of their spirit, God does a miracle. One family who spoke to me was touched deeply, beyond the emotions. Their hearts were bent and perhaps healed a bit by seeing the choir’s ministry. My thoughts raced back about 18 years. The choir I was directing was singing for a women’s conference. After the performance, I asked the choir to line up in the front of the auditorium and pray for the women there. After a member of the choir had prayed for her, Betty came over and hugged me tightly. Betty and I were friends. I knew she had a young son who is mentally challenged. In my arms, she wept deeply. Wiping the tears away, she explained, “My great sorry for my son was that I thought God could never use Tony in ministry. Now, I know that God can use him even with his developmental disabilities.” Again, she cried. This time I wept with her. And I lift my voice to you. Jesus, You alone are worthy. I will worship none but you. While emotions are an important part of our human make-up, they can’t always be trusted. However, God’s economy is amazingly green. He can be trusted to turn what some people consider unusable into life-changing treasures. Has God used someone that you thought was unusable in your life? How have your members ministered to you? 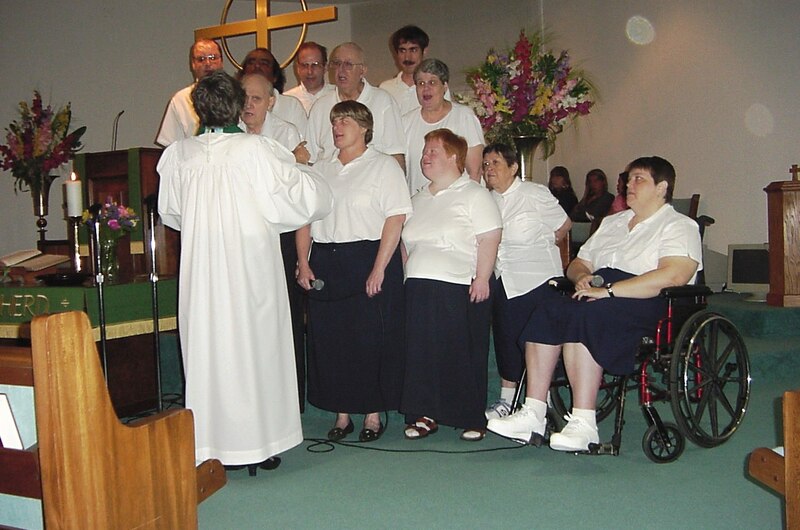 The hardest part about directing a choir of mentally challenged people is teaching them to look at me. In the twenty years that I have been a choir director for persons who are developmentally delayed for The Special Gathering, this has been a constant and consistent problem. In the 1960’s when the Jesus Movement was sweeping across America, my husband and I were swept into the miraculous wonder of the Holy Spirit’s healing touch. Though I was very young, almost daily, I had the privilege of praying for people. Occasionally, these were African-American women who were visiting our home. With this wonderful population of women, I was always faced with the same problem. They refused to look at me. No matter how bold they had been in conversation, when it came time to pray, they all took the same posture. They would sit with their heads pressed to their chests and their hands clasped in their laps, too timid to move or speak. Even if those words are not spoken, they are told that a million times in their lives in a multitude of different ways. I remember a funeral that I attended. The father of one our members had died. At that time, Nora was in her mid-thirties. She is a high functioning, well-spoken, sophisticated woman. Several times before and after the funeral service, her mother, brother and two sisters gathered in a circle. Comforting each other, they joined in a large group hug. Nora was never a part of the hug. She stood on the outside grasping her arms close to her chest, weeping alone. I don’t care how tonally correct the members of the choir sing but I do care whether they look at me or not. For some of the members, this is especially difficult. For it is not only part of our culture to not look people in the eye; but it is also part of their disability. Yet, I have never had one person who has not learned to overcome his training and disability. They have all learned to look at me. There is an element of self-worth that is essential in maturing in the Christian faith. Through Christ’s sacrifice, God makes us his children, not his slaves or lackeys. Perhaps the greatest joy I have when the choir performs is not the musical quality or the correct enunciation of all the words but 12 sets of eyes that meet mine and look at me, eye to eye. Equal partners in ministry, holding our heads and hearts high. It makes me want to have a large, group hug with no one left outside grasping their arms. What have you found to be the hardest thing for your members to do? Have you found that making eye contact is important to self-worth? What are some other signs of a good self-worth? Therefore, I began to improvise. First, I had a pianist friend tape some songs. I remember trying to get my extremely bad tape recorder to record a decent sound track. I ended up recording from the bottom of the piano. I sat under the piano and held the microphone close but not touching the bottom of the piano. It worked. Later, I discovered Maranatha Double Praise CD’s. Most of the songs have two tracks. First, there was a track with singer. Then the same sound track with the melody played by a lead instrument. These were wonderful and gave me a great deal of flexibility. Several things I learned quickly. 1) The choir must be a discipled effort on the part of the choir members and the director. Be sure that you know the music back and front. Know when to come in and when to stop. 2) Choral directions are vital for a mentally challenged choir. Don’t stand with your hands to the side. Use your hand, your mouth, anything you can to get the choir members to understand your directions. Several directors have devised signs for each word. They sign the words for their choir. I have so little eye-hand-coordination that I have never been able to pull that off. However, I do mouth the words to my choir and beat out rythym of the music like most directors do. I improvised simple signs that work to help me clearly tell each choir member if he/she is singing too loud and when to come in and stop singing. My sign for the choir not the sing is a closed fist. If one person is to stop singing or comes in incorrectly, I put my closed fist in front of him, signaling that he is to not sing. The choir learned the song in the first practice. They were excited. There was orchastration and they choir sounded great. Are there some tricks that you have learned in directing persons with developmental disabilities in a choir? How important do you think first impressions are?